The historical marker for the Martin Hotel is seen in front of Bessie Smith Hall on Martin Luther King, Jr., Boulevard on Wednesday, Feb. 8, 2017, in Chattanooga, Tenn. In 1930, Robert Martin asked his niece, Mayme, to come from South Carolina to Chattanooga to help manage his hotel. Robert, a former railroad dining car waiter, founded the Martin Hotel in 1924. Located on East Ninth Street on the site currently occupied by the Bessie Smith Cultural Center, the hotel featured 50 steam-heated rooms and a dining room serving three complete meals daily. Born in 1904, the seventh of 18 children, Mayme Martin never intended to spend her life managing a hotel. An educator and graduate of Allen University in Aiken, S.C., she intended to continue her teaching career in Chattanooga. Upon learning teachers earned even less in Chattanooga than in South Carolina, she decided to remain at the hotel. Before the Civil Rights Act of 1964, hotels and restaurants were strictly segregated. Black travelers, including well-known athletes and entertainers, stayed and ate at usually black-owned hotels and restaurants in most of the U.S. 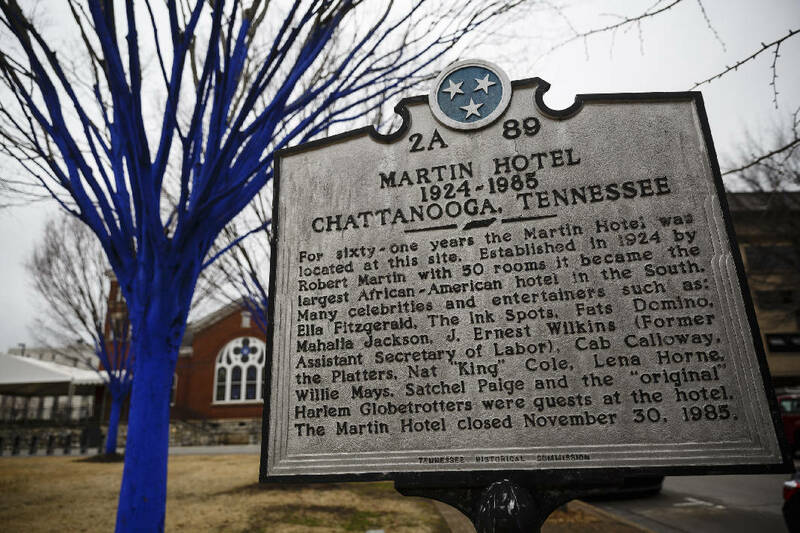 The Martín Hotel served black travelers and was the hub of Chattanooga black social life. Clubs and social groups as well as individuals met and dined together there. The hotel prospered, and when Robert died in 1936, Mayme became the manager. According to her niece, Dr. Oneida Martin, Mayme was a formidable woman who "always spoke very loudly and with authority. She always said, 'In dealing with the public, you have to be in charge.' People had such respect for her, nobody ever gave her any trouble." Just in case, Mayme kept two loaded pistols close by, stating in a 1985 Chattanooga Times interview, "I figured by the time I emptied both of them, the troublemakers would be gone." She never had to find out. During its 61 years of operation, the Martin played host to many entertainers, including Cab Calloway, The Platters, Nat King Cole, Lena Horne, Mahalia Jackson and Ella Fitzgerald. Black band members from the 1930s and 1940s stayed at the Martin while playing at Memorial Auditorium. White band members stayed in exclusively white hotels. A number of well-known athletes also stayed at the Martin including Satchel Paige, Willie Mays, Roy Campanella, Jackie Robinson and the Harlem Globetrotters basketball team. During World War II, black soldiers often stayed there on their way through Chattanooga. When celebrities arrived, often by bus, the word would get out, and crowds of excited fans would gather outside the hotel to greet them. Mayme, ever the considerate hotelier, kept the crowds out of the hotel so her guests "could get their rest." She didn't fawn over her famous guests and did not permit her family or employees, some of whom were members of her family, to bother them. However, Mayme herself did have a favorite — Ella Fitzgerald. When the singer was at the hotel, the two would spend time chatting "about this and that." According to Dr. Martin, who worked Saturdays at the hotel as a girl, her aunt "was always concerned about the (hotel's) image making sure everything looked just right. On special occasions she wanted "starched white linens on the tables." The floors were always shined. Mayme was active in a number of community organizations, including the Elks Club Auxiliary, serving seven years as state president, the Eastern Star; the Mid-city Garden Club, which she founded; the State Federation of the Colored Women's Clubs; and the Daughters of Isis. She was a member of the Warren Chapel AME Church, serving on its board of trustees and its Women's Missionary Society. By 1985, with segregation ended, the Martin had a number of permanent tenants. Black-owned businesses on Ninth Street decreased, and the street was re-named Martin Luther King Boulevard. The hotel fell into bad repair, and Mayme decided to close it, but not before locating a place for herself and her remaining tenants to live. In a Nov. 1, 1985, Chattanooga Times interview, she stated the hotel's closing would not "be sad for me. I've been here for so long. I'm just about tired of it. It's hard work "
Mayme moved several blocks down Martin Luther King Boulevard and ran a rooming house for several of her former hotel tenants. On April 27, 1986, she died in a fire in her first-floor apartment started by an unattended electric iron. No one else was seriously injured. Mayme Martin is buried in Forest Hills Cemetery. The Chattanooga Times attempted unsuccessfully to find a new owner to restore the Martin Hotel. The building was demolished in June 1986. Gay Moore is an author, speaker and frequent contributor to this column. Visit Chatta historicalassoc.org for more information.